It is essential to use very fresh eggs. Choose eggs from well-fed hens. Beat lots of air into the eggs. Take the pan off the heat BEFORE they overcook. Store bought eggs are at least twenty-four hours old when you buy them. If you are lucky enough to live near a farm then buying your eggs at the farm gate should mean fresher eggs. Wherever you buy your eggs, they need to be cooked from room temperature. Unless you live in a very warm climate there is no need to refrigerate eggs. 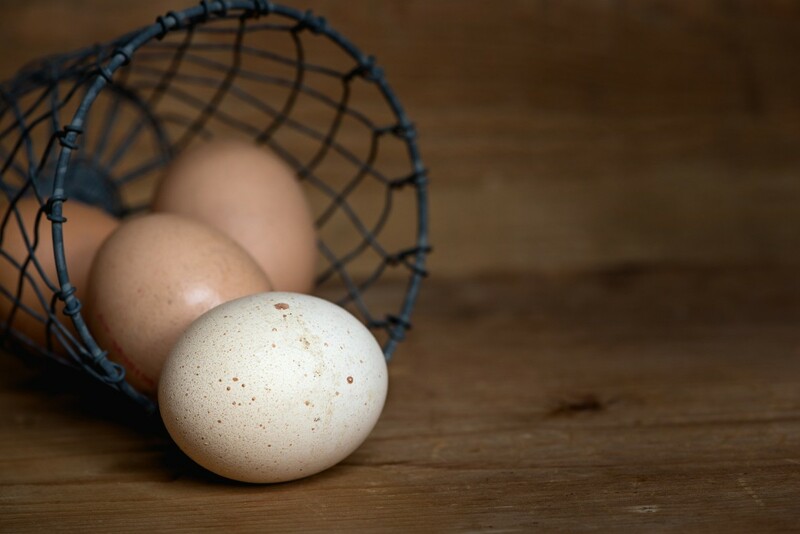 It is better to buy a few eggs often and store them at room temperature, than it is to buy them in bulk and refrigerate. Ceramic egg crates or egg holders andy for storing your eggs on your kitchen worktop. They keep the eggs at the correct temperature and are decorative too. Some people keep a couple of pet hens in the backyard to make sure they get really fresh eggs. Of course, if you do this you would need to spend a little time caring for the chickens, but the better taste of new laid eggs will compensate for the extra effort involved. 16% of the Recommended Daily Allowance (RDA) of Vitamin A. 36% of the RDA of Vitamin B2 (riboflavin). 108% of RDA of Vitamin B12. 24% of the RDA of Folate. 39% of the RDA of Biotin. 23% of the RDA of Pantothenic acid. 42% of the RDA of Selenium. 34% of the RDA of Iodine. 26% of the RDA of Phosphorus. 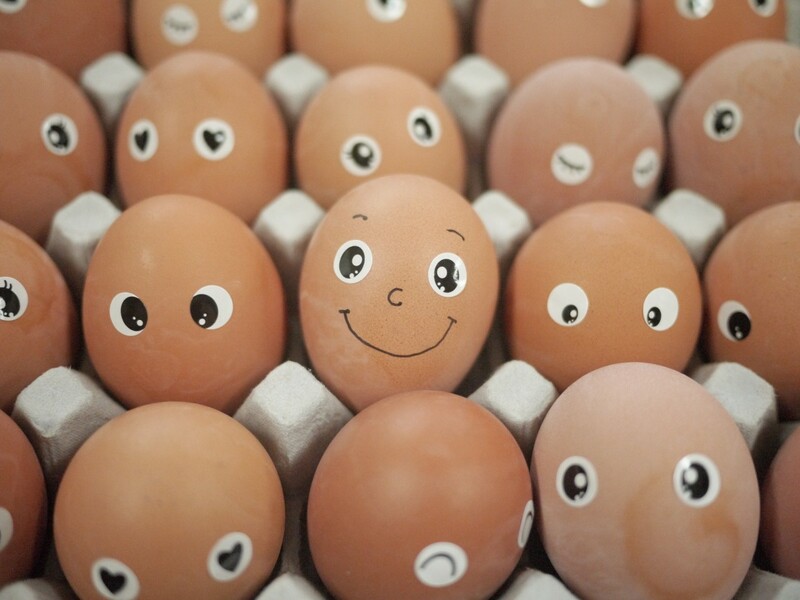 Eggs also contain Vitamin D, Vitamin E, Vitamin K, Vitamin B6, Calcium and Zinc. Whatever your source of eggs, you will need to learn to recognize what a fresh egg looks like. A fresh egg has a firm yolk and thick viscous egg white. When you crack your eggs into the mixing bowl, check that the yolk stands strong and proud. It should be the shape of a baseball cut in half. It should be a symmetrical half-spherical shape. 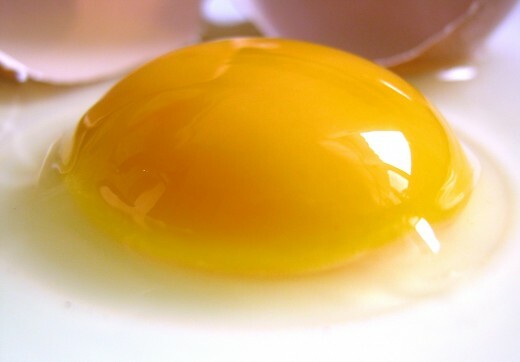 When eggs are several days old, the yolk sinks down and the white becomes thinner and runnier. The taste of your egg is determined by the diet of the laying chicken. Some people say that the best tasting eggs come from corn-fed hens. Organic free range hen’s eggs may also taste better than other eggs. Home reared chicken’s eggs should taste extra good because the hens have been fed on kitchen vegetable peelings combined with corn. 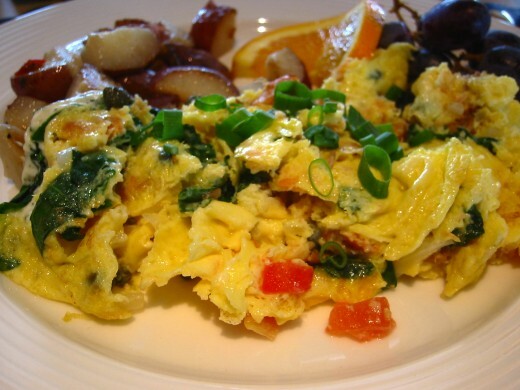 To make fluffy scrambled eggs whisk the yolk and white together briskly using a fork or hand-whisk. This should be done by hand; there is no need to use an electric whisk. It will take less than a minute of wrist whisking action. As you beat with the fork or whisk briskly, raise your arm up and down slightly to trap air into the mixture. Make sure the milk is as fresh as possible. Semi-skimmed or whole milk works best for this dish. For each person use two beaten eggs and one tablespoon of milk. 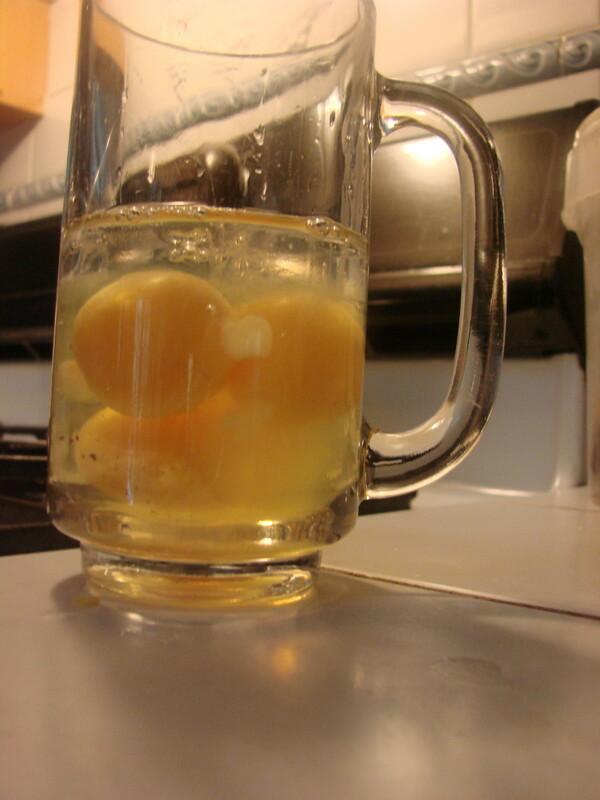 Gently stir the milk into the foaming eggs and add a pinch of salt and pepper to taste. Melt a knob of butter in a non-stick pan. With a wooden spoon or non-stick spatula move it around and ensure it covers the whole of the pan before you add the eggs. Keeping the heat on high, pour in the beaten egg mixture. As the eggs cook, gently move the mixture from the center to the sides of the pan. 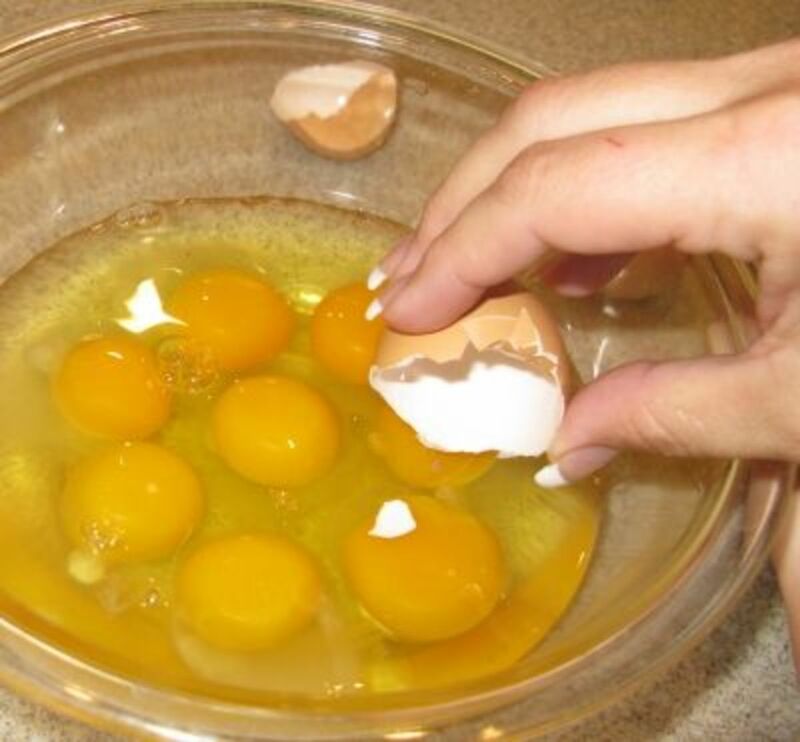 By doing this, you will ensure that all parts of the eggs can reach the hot surface of the pan and cook. The frying pan must be removed from the heat source BEFORE the eggs are fully cooked. The scrambled eggs will continue to cook using the heat retained by the pan, even after you have taken them off the heat. Taking them off the heat early stops the eggs getting overcooked and thus keeps them nice and soft and fluffy. The smell will be so tempting that you’ll have no trouble sitting down and eating them immediately. 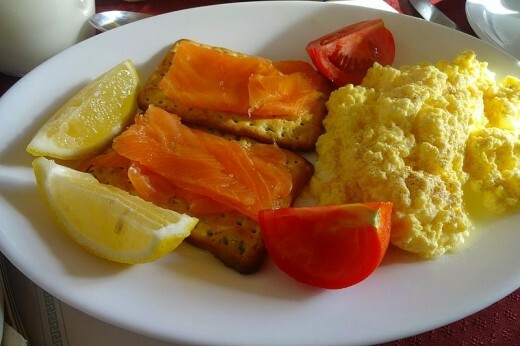 Fluffy scrambled eggs are great on their own or you can eat them with hot buttered toast. For an occasional treat you could add a tablespoon of grated cheese to the egg mixture. This makes them extra tangy and delicious. For a really quick and easy meal, add scrambled eggs to a can of tomato spaghetti (and a slice of toast too if you want some more carbs in winter). Do Scrambled Eggs Clog Sinks? Before washing dishes in the sink, it is good practice to scrape food remnants on plates into the garbage. 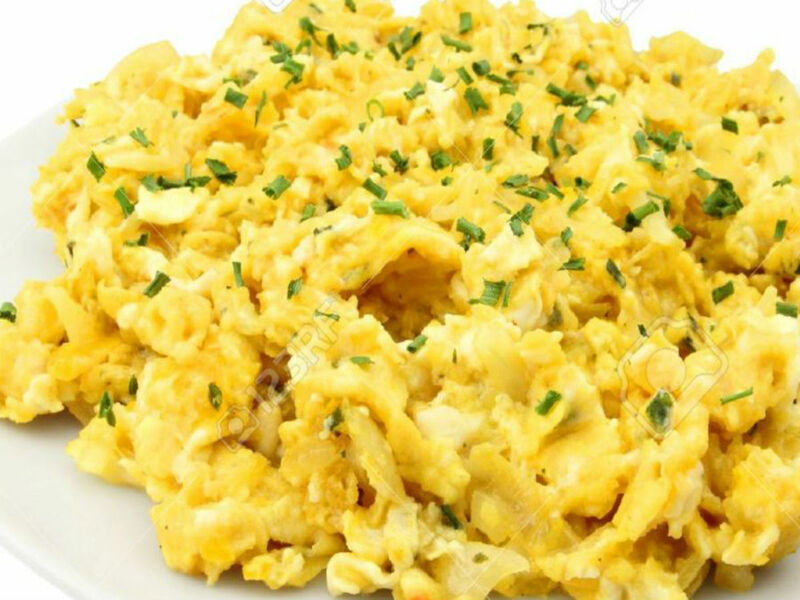 Even though scrambled eggs are soft and seem to flush away, they can catch on bends later on in the underground waste system. Any food solids in waste water can form a ball with other items (like fat or wet wipes) and cause a blocked drain. You can add food waste to a garden compost heap, as long as it is positioned some distance from your house. Cover food scraps well with grass cuttings and gathered weeds. This will minimize the possibility of the decomposing organic matter attracting rats.